Even though the holidays are supposed to be filled with nostalgia and time spent with family and friends, 90% of Americans report being stressed during the “most wonderful time of the year.” The holiday season brings with it the pressure for many to host parties and family dinners, or bring the dreaded “dish to pass.”One of the top holiday stress factors is fear of gaining weight. Mashed potatoes laden with silky gravy; decadent cookies and pumpkin pies; dips and spreads atop baked goods; and rich, creamy eggnog remain staples at most tables. With the high calorie and fat count found in most of these traditional holiday foods, it’s no wonder consumers are stressed about maintaining a healthy weight. Whether your facility produces sugar cookies topped with glazed frosting, sweet pumpkin pies with whipped cream, or something in between, the formulations for these types of sweet treats often require eggs, butter, cream and/or cream cheese. Not only are these ingredients highly perishable; they’re expensive and loaded with fat and calories. Using functional whey protein as an alternative ingredient to reduce - or completely replace - premium ingredients can maintain and often improve viscosity while reducing ingredient costs and complementing various flavor profiles. Holiday party tables are often filled with a variety of snacks begging to be dipped in creamy sauces, and the convenience of pre-packaged dips and spreads has stirred up consumer spending in this arena. Consumer interest is driven by a willingness to try new flavors combined with an ongoing demand for nutritious food products. Traditionally, this category has been known for being high in fat and calories. Unlike commodity whey protein concentrate, Grande Bravo can complement a product’s original flavor profile, viscosity and mouthfeel and improve the nutritional value of dips and sauces. 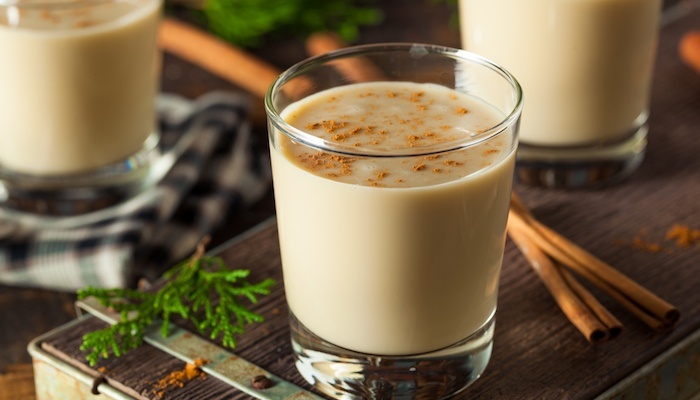 A true holiday favorite, this drink is loaded with fat and calories. Maintaining the rich, creamy texture and distinctive taste while reducing or eliminating some of the high-fat, high-cost ingredients such as eggs and heavy cream with whey protein can not only keep consumers happy, but could also help to position a food manufacturer as a real innovator in the market. Despite being more concerned about their health, most consumers aren’t willing to compromise on the traditional flavors found at family gatherings during the holidays. Learn more about the functionality whey protein can offer by checking out our free Grande Bravo Case Study by clicking the button below. And if you’d like to learn how Grande Custom Ingredients Group can assist in developing the ideal solution for your application challenge, reach out to our team of experts.